I guess its important to have the latest and the greatest field guide, but in truth nothing changes much from edition to edition. Range maps change – you won’t find house finches in the mid west in guides from 30 years ago – but the images and keys to identifying subjects stay the same. So I’m a fan of picking up what ever field guides I can find. Used bookstores often have older editions at bargain prices, and the way I see it, the more pictures and descriptions you have of a subject, the more likely you are to figure out what it is. As I’ve mentioned before, its usually pretty easy to identify mammals and plants from field guides. Unlike insects – where there are literally millions of species and many have different markings based on gender and age (not to mention the larval, nymph, and adult stages of development) – mmamals and plants shoudl be easy. So why can’t I identify this flower? So – what is it? Beats me. The flowers were 1 to 2 inches across, and grew on grass like stalks. I’ll keep consulting the field guides – but perhaps this is truly the last of the spring wildflowers for 2006. Technical details: shots taken with Pentax *ist-D and Kiron 105mm f2.8 macro lens. So far the spring of 2006 has been disappointing for insect photography. After weeks of cold and wet weather, things are finally warming up. However, the insect population has yet to really burst onto the scene. My most recent trips out looking for insect subjects have been disappointing. Yesterday I went to the Allegan Forest and visited several areas along 46th street. The lupine is out in full force, and crops up in several areas. I first visited some open fields, which in a few weeks will be full of coreopsis and vetch. These have been areas that have been fruitful in the past, and while I caught a few glimpses of Monarchs, Spicebush, and Tiger Swallowtail butterflies, I had no luck getting shots. After hitting a few wooded areas that are usually (but not now) full of dragonflies, I settled on shooting along Swan Creek. I’ve always viewed this area with high expectations for Odonata. The creek spawls out and fills several acres in this area – with a deep channel and shallow flooded shelves on both sides. There is a levy about 30 to 50 feet across, that runs along the creek, and a small dam that regulates the flow of water both down stream and into a flooded, marshy wildlife refuge. I’ve seen wild otters in the creek here, and Osprey and Eagles nest in the refuge. A path runs along the top of the levy, ultimately rising into a mixed forest. The mix of wetlands, the open trail, and forest all seem ideal for odonata. Yesterday, at least, there were a fair number of damselflies along the levy path. It was a cool and blustery day, and the insects hung low, usually lighting on grass stalks just a few inches above the ground. As is often the case with insect photography, I spent the time lying or crawling on the ground, trying to keep the camera down low enough to get a clear shot of the damselflies. Today I again returned to the Allegan Forest, this time to work a large field along 48th street. This is one of the few areas in the preserve that shows traces of its past. There is a small corner of a building foundation visible in the field, but more significantly, the vegetation shows the influence of past cultivation. The open field has large areas of wild strawberries, huge patches of prickly pear cactus, and a few areas of iris, just starting to bloom. The woods are full of European Lily of the Valley, and spiky palms – the type used in potted plant arrangements - stick up out of the grass. Here I found a few butterflies, a several caterpillars, tiger moths, lots of grasshoppers and lacewings. And in the “eeeeew gross!’ department -- The high point of the day was the discovery of a few ticks, hanging onto grass blades, waiting for a host to come along (someone like me would do nicely!) Like anyone who spends a lot of time in the out of doors in the spring and early summer, I have had my share of encounters with wood ticks. Though I douse my clothes (and myself) with DEET, the sight of a tick creeping up my pant leg or shirt is all too common. I knew that these creatures waited for hosts on plant stalks, and have wanted to get a shot of them in this situation. So today I was actually happy when I caught sight of first one, and then another, Dog Tick doing exactly that – sitting at the end of a grass stalk, legs outstretched, waiting for a host. I managed to get passable shots of both – which turned out to be a male and a female. I was interested to see that they waited with their heads down, opposite of what I had imagined. I had switched from the standard 200mm macro, to a 100 mm lens. Photographing the vey small ticks – they are about 1/4th of inch in size – was a challenge, especially given the blustery wind. Ultimately, I got the shots, and was happy to take the photos, and leave the ticks behind! While the shots form today and yesterday are OK - and the tick shots in particular illustrate an interesting behavior - I'm still waiting for the first top notch shot of the season. Well - the weather is finally getting warm... Technical details: All shots, except the ticks, were taken with the insect photography setup, consistent of a Pentax *ist-D, SMC A * 200mm macro, and flash. Ticks were shot with the *ist-D and Kiron 105mm f2.8 macro, tripod mounted with no flash. Here’s a passable shot of a Black Rat Snake (Elaphe obsoleta obsolete). It's a near miss - almost, could of been good, but not. That blinkity-blank blade of grass poking up in front of the snake's nose, ruins what otherwise would be a nice portrait. To my eye, that one blade of grass really tanks this shot. don’t often see Black Rat Snakes, so the chance to shoot them in the wild is pretty uncommon. This one was particularly nice, because it was so big. I’d estimate its overall length at approximately 6 feet. I was in the Allegan Forest, trying to photograph insects, and was stumbling around a Honeysuckle bush hoping to get a shot of a tiger swallowtail butterfly. I did not get the shot, and amazingly did not trample this snake who was just laying in the grass, watching me. The snake was incredibly docile, and I actually pushed aside some of the grass in order to get down to eye level with in, in hopes of getting a decent shot. If only I had looked more closely at the LCD after shooting! Oh well… Since this follows on the heels of another snake shot, I dipped into the archives and pulled out one where I managed to do it right. This Red bellied Water snake was sunning itself on an early spring morning, and once again I got down to eye level (literally laying on the ground) to get a portrait. The water snake was not as docile as the Rat Snake – after a few blasts with the flash he came charging at the camera. Looking through the camera’s finder, there is something rather primal about the sight of an open mouthed snake striking out at the front of the lens! The water snake was shot on slide film, the rat snake on a DSLR. All of the snake shots (these plus the Hognose) were taken with the insect photography setup described elsewhere. With snakes, and other herpetological subjects, the reach of a 200mm macro lens certainly comes in handy! ….a.k.a. Eastern Hognose Snake (Heterodon platyrhinos) Yesterday I managed to slip away for an hour or so of nature shooting. I went to a nearby city park, hoping to get some insect shots. I only took my insect rig, since I knew that any more elaborate shooting would be out of the question due to the time constraint. Well, the bugs were a bust. I followed a few Pearl Crescents around, but came up with no good shots. Aside form one or two female white tailed dragonflies, I saw no Odonata. I finally stepped a few feet off the trail, into the wild garlic mustard, in hopes of snagging a shot of a good sized fly on leaf. “Wow,” I thought, “that fly sure does have a loud hiss!” then I looked down and saw this fellow a few inches from my hand. Michigan has only one venomous snake, and even that is fairly uncommon, so there is no need to worry about the snake you run into in the field. Odd are, they are more scared of you than you are of them. Since this was a more interesting subject, I stepped back and grabbed a few shots. The species is readily identifiable as an eastern Hognose snake, based on its upturned nose. This specimen is puffing up its head and neck area in threat display / bluff. I just grabbed a couple of shots, and being out of time anyhow, moved along. Over the course of the last several weeks I’ve posted a few notes about photographing spring wildflowers. There are places that I visit only for the spring wildflowers, and these essays have tried in a small way to chronicle the succession of wildflowers that grace the springtime woods in Michigan. In late March, wild garlic emerges from the dry leaves that carpet the forest floor. Hepatica and trout lily leaves emerge early in the chill of late March and early April. The leafless tress let light down to the forest floor, and the early emerging plants soak up the direct rays, using their few brief weeks when they have emerged from the earth to store a year’s worth of energy from the spring sun. After the wild garlic (which never flowers but presents the first carpet of green) and the marvelous blue and white hepatica, the real heyday of the wildflowers begins. The hepatica are sprinkled across the forest floor, but soon spring beauty, trillium, rue and wood anemone carpet the ground. Skunk cabbage, tree seedlings, and other non-flowering foliage also emerges. The forest leaves begin to emerge at this time, resulting in a filtered, patterned light reaching the forest floor. It is at this time that the diversity of spring wildflowers reaches its peak. Amid the hordes of trillium, spring beauty, and anemone, are flowering trout lilies, bloodroot, Dutchman’s britches, Squirrel Corn, and violets – both Canadian and Sweet. Wetland areas are covered with marsh marigold and swamp buttercup. This is when the red and nodding trilliums appear, bell wort, wild ginger, and jack in the pulpit. Later in the cycle, wild ginseng and blue eyed Mary emerges in patches. And then suddenly the corner is turned. The trillium fade from white to purple, and flowers collapse into rot. Anemone drop their petals, and spring beauty, after launching flower after flower, bend over with a chain of small seed pods, paving the way for the next season. A few late comers appear on the scene – wild geranium manages to rise up and bloom in the now shady and dark woods. May apples – whose foliage have stood like umbrellas since early spring – finally bloom late in the cycle, with their large white petals often obscured under the large round leaves. Although many of the flowers have faded and gone, the foliage continues – drawing in energy until the next spring. When I visited the woods yesterday, the wild garlic leaves were finally fading away. Bloodroot leaves, on the other hand, are almost as large as baseball mitts. Hepatica leaves, tout Lilly, and trillium foliage abound. Skunk cabbages luxuriate in the wetlands, and for the next several weeks the forest will glow green, even without the adornment of wildflower blossoms. As the summer advances this undergrowth fades – only the small trees and brush preserving a green undergrowth as the forest canopy thickens and cuts off the light to the ground below. This last visit showed many faded and ragged trillium blossoms. The trees have begun dropping seeds, and the remnants of their flowers, so the plants below were covered with this detritus. I took a few shots of wild geranium and the late blooming May Apple flowers – drawing upon Karl Blossfeldt’s work for inspiration, in particularly in regards to the marvelous detail and structure in the May Apple flowers. But ultimately, all things must end. I expect that this will be the last post of this subject until next spring. Of course, the climate changes a lot in a short distance, and if I traveled north or closer to Lake Michigan, I could probably find areas where the wildflowers are weeks back in the cycle. But its time to look for some new subject matter – in particular to find some decent insect subjects – as so I’ll say goodbye to the spring flowers for now. The rain and cold broke briefly for a while yesterday, affording a fleeting opportunity to get out and pursue bugs for a while. A couple of the best shots came from my own back yard, where the Blue Bottle Flies were buzzing around on the leaves of the emerging garden perennials. Later I managed to get out to the Allegan Forest, hoping to again track down an Olympia Marble – but this mission met with no success. I chased a few cabbage whites around until I confirm their identities, and then finally gave up hopes of finding the more butterfly and set my sites on pursuing the few damselflies that were hovering about the water’s edge. It was slim pickings, but a few shots came together. And the a brief session with a beetle on windswept grass, and a perhaps lucky shot of it walking on the wind tossed stalks. I’ve had a hankering to do some fly portraits these last few days. Unfortunately, the cold and rain have kept even the flies at bay. Odonata – dragonflies and damselflies – are all magical and light. They are the emissaries from the spirit world, the messengers with word from beyond, the winged jewels that dance on the air. Diptera – flies – one the other hand, are all Beelzebub, filth, and mud. They are Caliban to the Odonata’s Ariel. Or so our culture tells us. But I like to photograph them all – and for a change in pace, the Windwalkers too. To ‘photograph’ this I simply set it on a flat bed scanner and scanned it. I used the transparency adapter, so the light was projected through the bulb to capture the luminosity that makes the bulb interesting. Only a small area of the light actually touches the scanner bed, so Newton Rings (ugly more’ patterns that appear when you try to scan transparent items laid directly on the scanner bed) weren’t a problem. I’ve been surprised at how much ‘photography’ is done with flatbed scanners. I guess that scanners _are_ cameras of a sort – they are just cameras that cannot focus more than a half an inch or so away from the front of the ‘lens’. You can get pretty huge, high resolution images, though lighting options and portability are limited! I actually had to touch this up a fair amount – apparently the burnt out filament left behind not only smoky residue, but ash as well. It was ugly as distracting, so I spent more than a little time cloning it out. It’s been dark these last few days. Not in some metaphorical sense, but literally – dark in the daytime. Heavy clouds, steady rain, a good week of this… Not ideal for photographing outdoors. Not ideal for natural history photography – close ups of insects, shots of wildflowers. And you can more or less rule out a lot of toy camera photography – the fixed shutter speed and apertures are calibrated for sunshine, and there are limits to how far you can push film. Well, anyhow, I still try to carry a camera or two around with me and grab whatever incidental shots I can. I recently was helping ot clean out a house that is about to be sold. I took a Nikon Coolpix 990 with me, along with a Holga. “Bush and Pole” is the only Holga shot to make it to this blog – most of the negs were just too thin to scan, even with a hefty push to the development. I like the hypermodern feel to the image, even though it deviates from the theme a bit (I was running an errand at the superstore and stepped out of the car in the parking lot to snap this shot.) All of the close-ups are found object still life images. 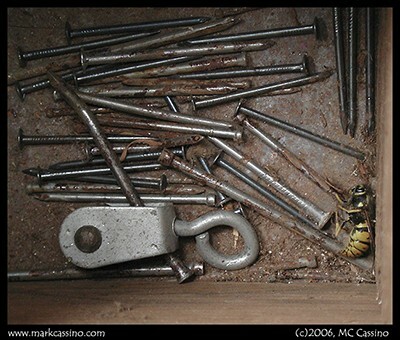 “Still life with Nails And Paper Wasp” just popped before my eyes as I dropped a wooden drawer full of nails and bits and bobs of other hardware into the back of my car. No arrangement of the nails was needed – I guess things like that just confirm the impeccable order of the universe. As Morgan says, “There are no misteaks." So I spent the day actually accomplishing some tasks – like cleaning and packing and loading – but also contemplating the light as it fell on the bare walls in the now empty house. Technical details: Holga shot taken on Classic Pan 200, developed in HC110 Dilution H for 25 minutes (very low agitation.) Color shots taken with Nikon Coolpix 990.